Delicious casserole featuring our Tomatoes, Okra & Corn. Bring chicken broth to a boil in a large saucepan. Stir in rice and butter; turn heat to low and simmer until liquid has been absorbed. Stir in Margaret Holmes Tomatoes, Okra and Corn (do not drain) along with grated cheese and cream of chicken soup (mix well to blend). 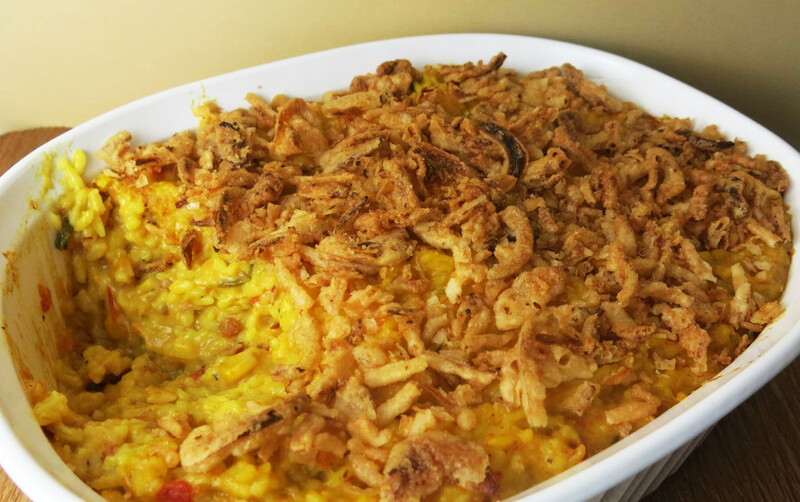 Transfer to a 2 quart baking dish and sprinkle with French's French Fried Onions. Bake for 20-25 minute until onions start to crisp. Note: A vegetarian version of this dish can be made by using vegetable broth (in place of chicken broth) and cream of celery soup (in place of cream of chicken).